We talk about comedians needing to ‘find their voice’ fairly often in reviews, but rarely mean it literally. 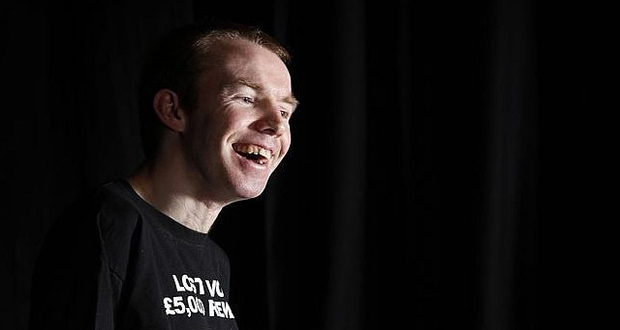 In the case of Lee Ridley – a.k.a Lost Voice Guy – he found his with the help of an iPad after losing his ability to speak when he was a child. Ridley, who has cerebral palsy, uses a voice synthesizer to tell the story of his hospitalisation during last year’s Fringe, amongst many other things. He was rushed in due to pneumonia, and while that might not sound like a particularly amusing anecdote, Ridley adds typical comic twists and turns to transform it into an interesting, self-deprecating look at everything from Mr Men books to the Paralympics. He also throws in some great gags about his disability that have the room in stitches right from the start. He’s a charming guy with a real twinkle in his eye and he works the room physically while the iPad does the talking. After a while, as with subtitles, you almost stop noticing that he’s not actually speaking, though as his material largely revolves around the issues he’s faced you can’t brush it aside entirely. He even pauses regularly for comic effect: it’s a bit like being entertained by a more suave, sophisticated, ‘posh’ version of Robocop: something Ridley also refers to in the show, as well as imagining a fight to the death with Stephen Hawking. Although the jokes are well delivered, the overall structure of the show needs a bit more work. After an entertaining initial 20 minutes, the pace slows a bit, as does the material. At that point, we could do with some more belly laughs but instead the jokes seem to get even gentler and, at times, fall a bit flat: especially some of the weaker one-liners. That said, it’s certainly not a bad show, and Ridley does a great job of challenging our prejudices and perceptions about disabled people. It’s also pretty inspirational, although he’ll probably hate us for saying it. Ridley has overcome a great deal in order to stand up on that stage, last year’s hospitalisation included. When you pause to think about it, why should not being able to speak stop you from performing? Why should anything stop anyone from performing, especially in this day and age? Hopefully more wannabe comedians with a disability will see Ridley’s entertaining show and be encouraged to take the plunge themselves. If Lost Voice Guy can do it, anyone can.